Technology is an amazing quarterly. It is so much fun! I can’t think of a better way to start off the year. Although technology is very dangerous, it is also very cool how we get to use all of these amazing machines. We had some accidents from some machines, including the hot glue gun, but none of these accidents were severe so no one got that hurt. We have made some amazing projects, including making switches, making flashlights, and making automitas. All of these machines are really cool. My favorite machine that we made was the automata. An automita is a matching where you pull a crank and something happens at the top of the box. Even though the automita is the hardest build, it has been super fun to make. I’m not quite finished with it yet, but I can’t wait to see the final product. Anyway, I had so much fun this quarter and I am really going to miss it. 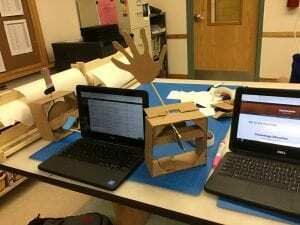 The past few days, in Mr. Calvert’s technology class, we have been building automitas. Automitas are machines that can do things, (like make a flag go up and down) and all you have to do to make them work is turn a crank. Building automitas are so fun! But they can be dangerous too. We’ve been working with drill presses and band saws. If you touch a band saw your finger will get cut off! So I’ve been a little nervous working on this project. So far my automita is going pretty well. What I’m trying to do is to make a hand waving at the top of my box. I can’t wait to see my final product! Today I finally finished my flashlight! It is really cool and actually works. I have not tested if it is waterproof yet but hopefully it is. This counts for my grade, but I’m not worried, because I think I did a pretty good job on my flashlight. First I cut a PVC pipe to the size I liked. Then drilled a hole in the cap for the LED and a hole in the pipe for the switch. Then I got to work on the circuit. When I finished soldering the circuit together I put the circuit into the PVC pipe. It was actually really hard. Especially getting the switch into the switch hole and then putting the cap on the switch. It is a little sloppy but amazingly it works! When I finally got it to work I decorated. I had a lot of fun building my flashlight! Have you ever wondered how flashlights work? I have. And I didn’t figure it out until yesterday. The inside of a flashlight is exactly like the circuit’s we’ve been making for the past week. So the way to make a flashlight is to make a simple one LED light circuit, put it in a PVC pipe, flick the switch, and there you go, you have your flashlight. But are not taking a direct path to the flashlight. First we have to draw a diagram. I am currently working on my diagram and from what I can see it will actually be a working flashlight! On Friday Mr. Calvert had us build circuits based on what we had been learning for the past week. We made two different circuits. The parallel circuit and the series circuit. The parallel circuit is with two different light bulbs with two different circuits. The series circuit is one smooth circle circuit. The first circuit I made was the series circuit. I made the circuit but the light bulb wouldn’t light up. I couldn’t figure out why. After a little observing I realized that there was no switch. As soon as I put the switch in the light came soaring to life. Then it was time for the parallel circuit. This circuit was a much more complicated circuit. This took me a while to complete. At some points in the circuit there were like 4 alligator clips all clipped together. But with 1 minute left in class the two light bulbs came soaring to life. This week in technology we’ve been learning all about atoms. I used to think that all atoms were the same and that each one had 1 proton and 1 electron. But now I know better, and that’s thanks to Mr. Calvert. There are 118 different atoms, one for each element. The protons and the neutrons in the center of the atom form something called the nucleus. There are also rings on the outside of the atom. The rings are called orbitals. On each orbital is at least one electron. As you can see, in only a week I have learned a lot more about atoms than I have ever known about them. Last Friday in class we did something called a breakout. A breakout is a fun activity where there is a box with 4 locks on it. There are clues for the combos all over the classroom. The goal is to break into the box before the time runs out.My team wasted a third of the time having no clue what the combos. Then we had a good idea and we tried but it didn’t work. Then after a few minutes we found something else that could be the combo. But the person putting in combos misheard us say the combo and put in the wrong one. But soon we found out it wasn’t the wrong one when the lock popped open. That was lucky! We found the next two combos hidden in the same piece of paper. 3 down, 1 to go. The fourth combo was in an essay that Mr. Calvert gave us. I found what we thought was the combo. We tried it and it didn’t work. We wasted another 10 minutes trying to break that code. By then I was certain that the combo I found was the right one. Sowe tried it again and this time it worked! We broke into the box with 50 seconds left on the clock. When I was in 5th grade I was in an afterschool club called Makerspace. 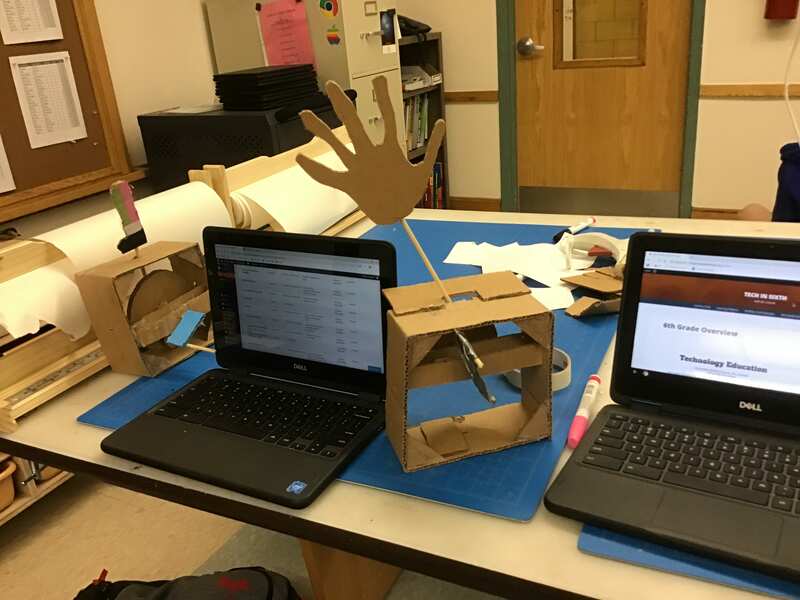 Makerspace is a club where you can make digital games or you can create something with your hands. One day my Makerspace teacher showed us this really cool thing that you can make using paper engineering. It was a bunch of paper strips that you connect and you can basically push them in and out. Then I realized that if I made two of them and connected them to two boards it would be a spring. After that idea of making a spring things moved pretty smoothly after that. I easily made the two paper push things. It was also a breeze making the two boards. Then things started going wrong when I had to connect the paper pushees to the boards. I couldn’t glue or tape because the paper pushees wouldn’t be able to move. I tried soooooo many things and nothing worked. I was on the verge of giving up when I finally got a good idea. I was looking for pictures of spring on the internet and in one I saw a bar at the bottom that my paper pushees could slide through. So I tried doing that out of paper and it finally worked!! It wasn’t a very good spring but it was a working one! The last step in the Capstone project is actually performing you final project in front of the school and the parents. On Monday I performed in front of two other classes, a 1st grade class and a second grade class. Performing in front of the 1st grade class I wasn’t nervous at all because it was my sister’s class and I had already practiced in front of her multiple times. So I thought, Hey just another practice. The second grade class I felt a little more nervous though. Then on Tuesday I performed in front of the parents. I had to perform in the auditorium and I was not happy about that because I don’t like performing in big spaces. Performing in front of the parents was actually way easier than I though it was going to be because I knew almost everyone out there so I knew they weren’t going to judge me. I had so much fun doing this Capstone project and I hope we could do it again sometime in the future.